This event is one of the wildest, most colorful events in all of equine sports. 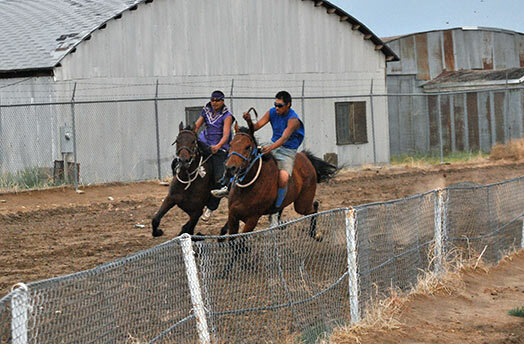 This event is a long standing event at powwows and Indian rodeos, the sport of Indian relay racing is a crowd-pleasing spectacle that involves expert horsemanship, teamwork, pageantry and the potential for disaster at every turn. Teams each have their own colors and consist of one rider, three handlers and three horses. The first team lines up at the starting line. Team members hold the second and third horses for the relay team along the rail. At the signal, the mounted jockeys race the first lap around the track. As the contestants complete the first lap, they cross to the rail, leap to the ground and attempt a quick leap aboard their second horse. The second and third horses are no longer standing quietly, but jumping and rearing from the excitement and noise around them. The action continues as the second lap is completed and riders vault aboard their third horse. The field plunges on to the finish, where one triumphant team takes the prize. Automatic disqualifications: use of twitches, lead ropes or other restraining devices; a loose horse on the track; initiating over two false starts , drinking or drug use before or during the event. Judge has the right to disqualify any team for having unfit or unruly horses, animal cruelty, unsportsmanlike conduct or arguing with judge/officials.